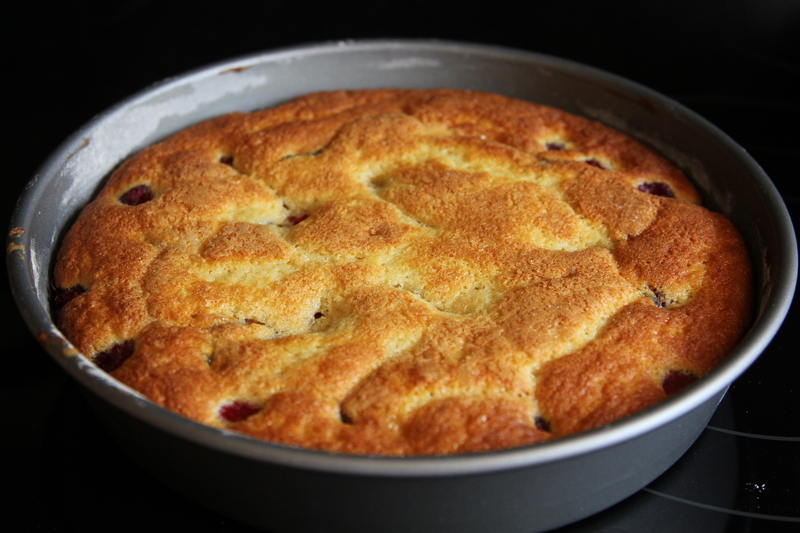 Raspberry Buttermilk Cake [Recipe] – Cin Cin, Let's Eat! I had some buttermilk leftover from making the pistachio whoopie pies (see previous entry), I flipped through my collections of magazine/newspaper cutout recipes, and found an easy buttermilk cake recipe with sweet raspberries I got at the farmers’ market. 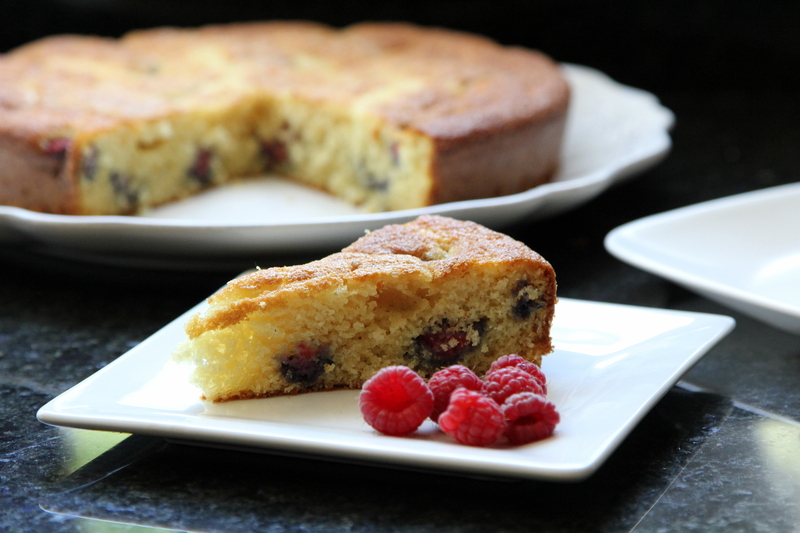 It’s a very light and fluffy cake with tart and juicy berries, just the right amount of sweetness for me, which just means it’s not very sweet at all. (You can probably tell by now that I almost always reduce the amount of sugar added.) You can also substitute the raspberries with any other kind of berries. Preheat oven to 400 with rack in middle. Butter and flour a 9″ round cake pan. Beat butter and 2/3 cup sugar [I used 1/2 cup] with an electric mixer at medium-high speed until pale and fluffy, about 2 minutes, then beat in vanilla. Add egg and beat well. Spoon batter into cake pan, smoothing top. 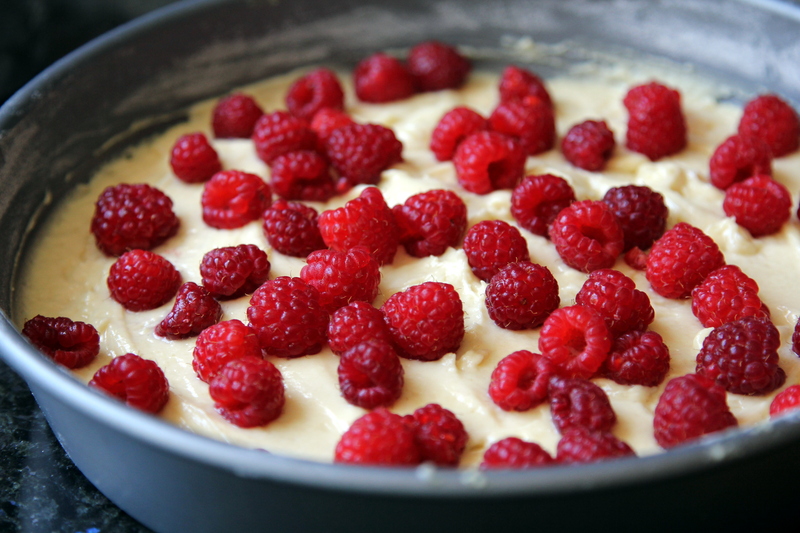 Scatter raspberries evenly over top and sprinkle with remaining 1 1/2 tbsp sugar [I used 1 tbsp only. Sprinkle more for that thick crunch of sugar]. Buttermilk is so great for so many things. I love this cake. My wife always cuts the sugar too. Does buttermilk make things lighter and more spring-y? I noticed this cake was fluffy and found that similar texture with buttermilk donuts, too. Loved how this stayed moist and had a nutty texture from the raspberry seeds. Thanks for making my tummy so happy with it! ii’ve also made a buttermilk cake before (like you I had some leftover buttermilk!) and found it surprisingly moist and delicious. i think buttermilk cake is the way to go! !